Automatically Cross-Listed Courses: Why are all my students in the same course? Why are all of my graduate and undergraduate students in the same course? Course Names, Section Names and Course Codes are generated by Tulane Registrar’s student information system (SIS). Some courses are automatically cross-listed in Canvas by the registrar’s office. This was previously known as course merge in Blackboard. For example, a graduate and undergraduate offering of a course topic taught by the same instructor may be cross-listed automatically. Other courses are manually cross-listed by the instructor using the cross-list sections tool. 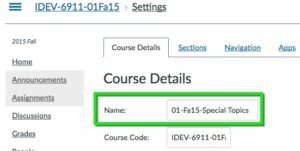 In both instances, the Course Name and Section Name fields are editable by instructors. Why is my course name different than I expected? Generally, the Course Code and Course Name both represent the course information as intended by the instructor. In some cases, when different sections are cross-listed or merged, a different course name is applied in the SIS. Instructors can change the course name in Canvas as needed. Example: Undergraduate section ANTH-3400-01 and graduate section ANTH-7400-01 of the course name Language and Culture. The courses are taught by the same instructor and are also cross-registered in the SIS. The cross-registered course often yields a course name that is distinctly different than the actual course name (i.e. Special Topics instead of Language and Culture). How can I verify my courses are cross-listed? Login to your course in Canvas, then go to the Settings menu in the course. In course settings, select the Sections tab from the menu across the top. The Sections tab will list the sections. How can I change the course name? Login to your course in Canvas, then go to the Settings menu in the course. In course settings, edit the Course Name field and click Update Course details at the bottom of the page. The course is renamed and the change is visible in your Dashboard. What is the difference between the Course Name, Section Name and Course Code? Course Code: Represents the course ID assigned to the course in the SIS. Course Name: Represents the default name assigned to the course in the SIS or new name of merged courses. Section Name: Represents the course enrollments and actual SIS course ID.